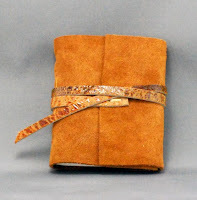 "The time for luxury is now"
This week's giveaway is a phenomenal Mini Suede Journal from Christine Marie Ford (http://www.christinemarieford.etsy.com/). Christine is a fabulous artist who specializes in Jewelry, Fiber Art, Quilting and Inspiration! Please visit her linked just above for fantastic gifts and treasures! This week's winner, that I am pleased to announce, is a fellow Etsian who specializes in stuffed toy animals, plush dolls, playsets and handbags. And the winner is....................WISH WITH ME.....................!! Please also visit Wish With Me at http://www.wishwithme.etsy.com/. Congratulations, I do hope you enjoy your Mini Suede Journal. Thanks for blogging in and I hope you will join me next week. Have a wonderful weekend!! Oh man! What sales they have! Valentine's Day Scavenger Hunt for my Special Valentines! Victorian Inspired Arts & Crafts From Etsy!